I’m going to begin with a reboot of the story of the Rich Young Ruler. That’s a lot. It's deep stuff. The gist is that we can’t know that what we are doing in our lives is exactly what the Lord wants us to do, unless we offer up to Him everything that we have, and are. And if we aren’t utterly confident that our course in life is pleasing to God, we can’t have absolute faith. If we don’t have that faith, we will falter and risk being overcome and losing our way. What are we willing to sacrifice? What do we hold back from the altar? I know that there are times I am terrified that Heavenly Father will ask me to let a child go. What? Who sent him down there? I miss him! Bring him back, NOW! Yes. I was truly convinced that any moment, I would have to give him back. And it still scares me to think of losing any one of my children, or my husband. I'm pretty sure I'm holding them back from the altar, or at least using my biggest puppy dog eyes and looking up at Heavenly Father begging him to not have that be something asked of me. So I am well aware that I may be lacking in the "willing to sacrifice" department. Some sacrifices are harder to make than others. I like the story of King Lamoni’s father. When he was taught the Gospel, he cried out in mighty prayer, begging to be saved, and promised to “give up all his sins” to know God. The conference concluded with a testimony meeting in which a handsome, young returned missionary stood up to bear his testimony. He looked good, clean, and confident—just like a returned missionary should look. Are we willing to sacrifice our favorite sins in order to have confidence in front of our Heavenly Father? “Ye shall offer up unto me no more the shedding of blood; yea, your sacrifices and your burnt offerings shall be done away. … And ye shall offer for a sacrifice unto me a broken heart and a contrite spirit. And whoso cometh unto me with a broken heart and a contrite spirit, him will I baptize with fire and with the Holy Ghost” (3 Nephi 9:19-20). To have a broken heart and a contrite spirit is to be humble and receptive to the will of God and to the counsel of those He has called to lead His Church. It also means to feel deep sorrow for sin and a sincere desire to repent. The prophet Lehi emphasized the importance of offering this sacrifice: “Behold, [Christ] offereth himself a sacrifice for sin, to answer the ends of the law, unto all those who have a broken heart and a contrite spirit; and unto none else can the ends of the law be answered” (2 Nephi 2:7). Those who show their willingness to sacrifice as the Lord has commanded will be accepted by Him. He taught in Doctrine and Covenant 97:8: “All … who know their hearts are honest, and are broken, and their spirits contrite, and are willing to observe their covenants by sacrifice—yea, every sacrifice which I, the Lord, shall command—they are accepted of me” (D&C 97:8). “We are still commanded to sacrifice, but not by shedding blood of animals. 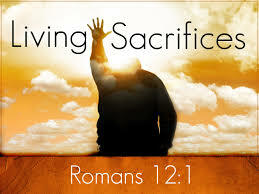 Our highest sense of sacrifice is achieved as we make ourselves more sacred or holy. This we do by our obedience to the commandments of God. Thus, the laws of obedience and sacrifice are indelibly intertwined. … As we comply with these and other commandments, something wonderful happens to us. … We become more sacred and holy—[more] like our Lord!” (“Lessons from Eve,” Ensign, Nov. 1987, 88). It is my hope and prayer that each of us, and especially myself, can place the parts of ourselves, the natural man, the animal, upon the altar and let go of our sins. I know that the Savior has already paid the price to have our sins be consumed and to purify us so that we can be clean. I know that as we sacrifice whatever it is that the Lord asks of us, --even our favorite sins-- that we will be strengthened and perfected. Thank you for this post. It gives me a lot to think about. Your thoughts always leave me feeling like a better just for reading them! Thank you so much for this post.